This sort of reaction was a lot more fun before the Internet. That was…um…19…60? 70? Wow, I really should know. Anyway. It was more fun and less expensive. You had slightly worse than a chance in hell of actually finding out who sells the whatever-it-is. More importantly, there was an even smaller chance that you could complete the transaction before the end-credits started to roll and the IQ-halving lust for acquisition had started to subside. Alas, it’s…wow. Again, I want to say “it’s 2005” but I know that’s wrong. A mere snip at $474.99. “I have $474.99,” I think. It’s distressing that I sometimes have to walk myself through a decision as though I’m parenting a child. But I know that the kid doesn’t really want to blow nearly $500 on a poster. He just wants to live with the fantasy for a while. It’s unnecessary for me to tell him that it’s nuts; to do so would be an insult. No, I just need to be supportive and patient while he makes his way towards what he knows to be the inevitable end-point. Yes: it’s an awesome poster. For God’s sake, head over to Adam’s DeviantArt page to see the whole thing. The first time I became aware of it, it was for sale in a gallery for something like $250. And the first time I became aware of it happened to be the last time I saw it for sale. Even then, it seemed like a lot of money for me to drop on that kind of thing. Ah, well. At least I have my Dave Dorman “Battle of Hoth” print to dress up the wall of my TV room. I bought it from Dave himself, at the one huge comic-con I’ve ever attended (San Diego 1999). Mind you, if you buy these expensive limited-edition prints, I have nothing but love for you. Hell, I couldn’t tsk-tsk your spending even if I were inclined to. I myself am scheming and plotting and planning to get an Adam Hughes convention sketch in 2010. That’s not exactly a “$20 and a six-pack of beer” commission. And yet if I can make it happen, I’ll consider it cheap at double. I guess it’s the difference between being Cheap and being Frugal. The $900 I spent on my Nikon D80 a few years ago was the single most expensive toy I’ve ever bought. But it was money well-spent. “I don’t own a spaceship,” I say, when I explain how this camera opened up my creativity and my imagination. “But my SLR comes close.” You know that you spent your money wisely if you think of the thing you bought almost every day, and you forgot completely about the expense the moment the cash left your hands. I never think about the $900 I spent for the camera. The $4 I lost playing roulette at a Las Vegas Night during college still stings. One, two, three, four: four dollars gone, in four spins of the wheel, in just two or three minutes flat. What a dumbass! It was such an embarrassing experience that — barring quarter-billion-dollar PowerBalls and the nickel poker slots I played at the one casino I’ve ever visited — I’ve never gambled since. 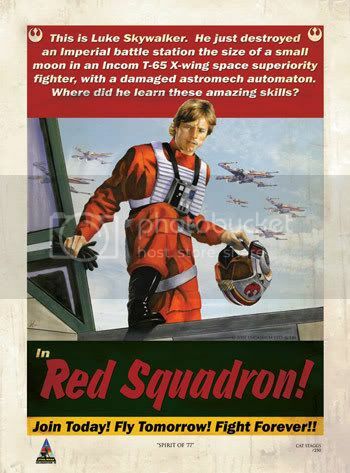 I’ve been digging this Red Squadron recruiting poster as well. The sad secret is that a giclée is nothing more than a very large inkjet printer. It’s true. I used to work at an estate buyer, and we had all sorts of licensed Star Wars art. The only value in a giclée is their scarcity. It drive me nuts when I see them go for so much money. Good for you resisting the urge. I know that urge for other things in life…ipods, gps, sparky bits that seemly have value. Good to resist and march on. I’ve been very similarly tempted by this Polish poster for The Empire Strikes Back – http://bit.ly/6LGhWH It was in stock when I first found it but has been unavailable for a long time. ‘Out of stock’ can be a great, if temporary, substitute for common sense. Adam Levermore created similar posters for BSG and Firelfly. 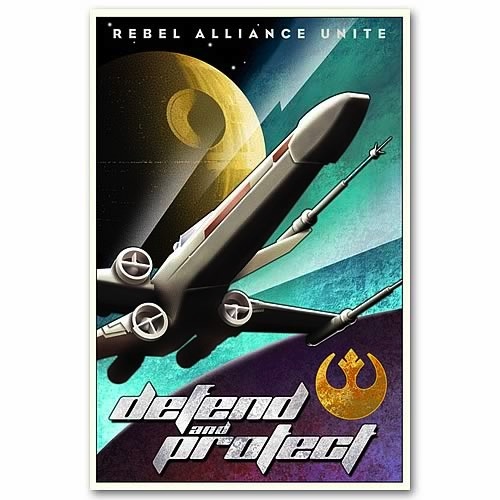 His site is http://www.adamlevermore.com/ and the posters can be purchased at http://store.quantummechanix.com/Battlestar-Galactica-Propaganda-Poster-Set_p_10.html for a steal. 1. Make “Defend and Protect” your pick for the week on MacBreak Weekly. 2. 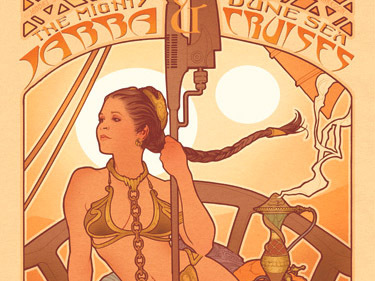 Set up a virtual tip jar for the sole purpose of acquiring the poster. 3. Plea on every podcast and social networking outlet for donations to tip jar. Careful, Andy. I think that $175 version is smaller than the one on TV. Which could just mean you have to stand closer to it. Or hang it in the loo. And I’m with you on the Leia poster. Been wanting that one, myself. Love the Big Bang, great show, but for supposed science fiction fans the characters show very little evidence of actually reading the stuff . All they talk about is comics, television and movies. In the old days we would call them “media fans” and curse them for taking over our conventions. Darn it, Why did I have to read the comments. 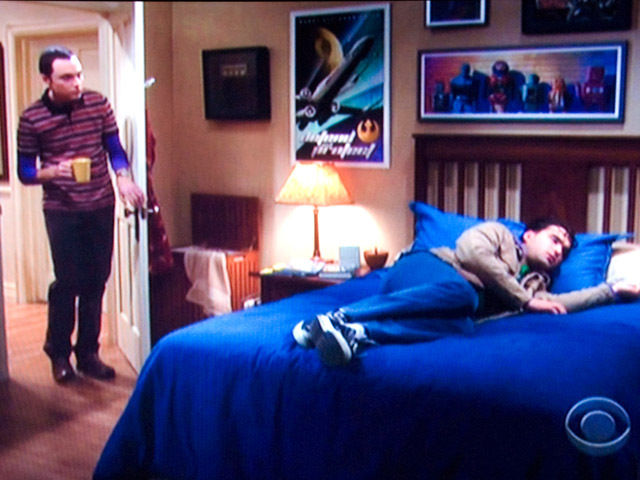 Now I want Deb’s Einstein poster. Good luck Andy, remember Apple’s iThingey is coming soon, that’s what I’m saving my cash for. Oh God. A giclee… what can be said about that word? How about “inkjet”. Sigh. Oh yah… nice poster, dude :-). While a giclée is just an inkjet printing (I don’t think it is a printer, just a printing), each one of them does cost a lot more to print than a poster made with a printing press. From looking around, a poster might have a $5 a piece marginal cost (remember, marginal cost doesn’t count setup cost), an equivalent size inkjet printing is going to cost many tens of dollars to print, $50 according to one source. It’s probably chosen because it’s well suited for very low expected print runs. I hadn’t found what the initial setup cost for a poster is. Giclee or inkjet prints cost depending on the quality of the paper and how many are in an edition, that does sound like a lot for a 24×36 though!